Few days back I happened to see the statistics for different Instant Messengers in Techcruch. Google talk was way behind in 4th place holding just 1% of the total IM market. Here is the statistics for the month of May 2006. 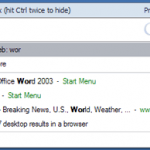 MSN is still way ahead of Yahoo and Google. However this count doesn’t include the number of people using Google chat embedded in GMail. I myself know many people who use this route. But again, even if we include this count , the market share for Google Talk is very less. We’ve been working hard to add your top-requested features to Google Talk, such as fast and reliable file transfer, and the ability to send and receive voicemail messages for free. 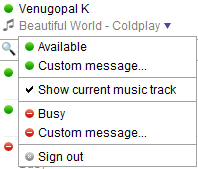 We’ve even created a fun little feature for you music lovers. This link has more details on the new features. With the exception of Voicemail message, the other 2 features are already there in MSN and Yahoo IM. This is supposed to be the top requested feature by GTalk users. With this feature, you can send files from the chat window. Additionally you can share photos, videos and documents, and the best thing is that there is no restriction on file size of file type. 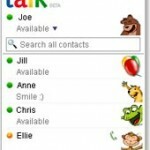 According to the official Google talk post, this version is available only to a small percentage of Google talk users. However Alex had dug out the setup from this link. Download and enjoy ! And as usual, Google setup does a silent upgrade and you will not even realized that you are upgrading to a new version. I personally prefer Google talk and it’s got one of the simples user interfaces and it’s done without compromising the basic IM features. Unlike Yahoo, it doesn’t take too much memory and doesn’t crash regularly. The most frustrating thing about using Yahoo has been the automatic Sign In/Sign out . If I receive a message from someone on Yahoo, it used to automatically sign out and sign. This is probably because of the version mismatch. One thing I noticed is that, unlike previous versions of Google talk, the latest seem to consume a little bit of more memory. Hope it eases a little bit in the final release. Good work keep going !!!! !